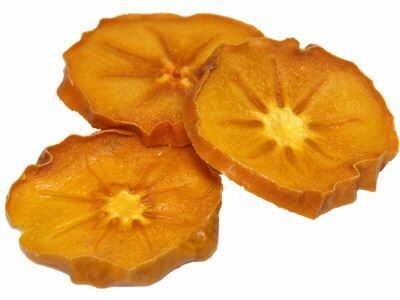 The dried Sharon fruit (persimmon) is wonderfully sweet and fruity, reminds of the taste of honeydew melon and peach, and contains all nutrient in concentrated form, which makes it a tasty and healthy snack. The Sharon fruit is a cultivated breed of the kaki without the bitter substance tannin, therefore the Sharon fruit can be enjoyed even before completely ripe, unlike the kaki. Sharon fruit originate from the Sharon valley in Israel, today they are also cultivated in Spain and South America. The fruit resembles tomatoes, has a yellow, smooth and thin skin surrounding the light, very sweet pulp. The Sharon fruit is renowned for its beta-carotin content (pro-vitamin A). In addition, Sharon fruit contain calcium, iron, potassium and phosphorus as well as the vitamins B and C.